Patience is so seldom asked for in a new novel that it's a pleasure to read a book that positively demands it if you are going to make the most of it. Sebastian is a vampire. Turned by his own mother and then forced to live for centuries as an eternal teenager, he turns to bloodlust in revenge for her killing. That bloodlust comes to a sudden and unexpected halt as he stands over one of his victims and discovers the baby she was carrying in a bag. This is Hanna Greene. 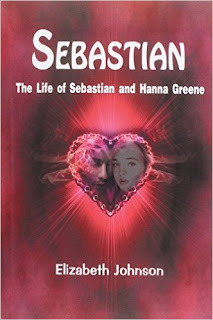 From this moment, Sebastian instantly rejects the cravings for blood that have turned him into a monster and becomes, by turns, first Hanna's protector, her guardian and then, her love. I found this latter aspect creepy, and difficult to deal with - from an almost parental position, he falls in love with her and that comes too close to grooming to be comfortable with. But should it be comfortable? The most successful vampire film of recent times, certainly artistically, was Let The Right One In, whose child vampire, Eli, simmers with discomfort in every aspect. I can barely watch the movie a second time, and yet, if someone asks me, I will tell them every time that it is brilliant. What matters here in Sebastian is that Hanna is no pushover. Without spoiling the story, she is a powerful character in her own right, both in ability and in her personality. That's vital, because she faces real dangers, with Sebastian not the only part of the supernatural world drawn towards her. She's smart, picking up on clues as to what is going on around her, and she carries secrets of her own as she seeks to find out who she is, leading to a crucial decision that, for the patient reader who has borne through sections that may have scritch-scratched at the inside of their heads, provides validation at last. So be patient when you pick up this book. Be patient as you work your way through the hefty opening as Sebastian recounts his history - the real action of the novel doesn't get going until after Hanna's first appearance more than 100 pages in, and for much of that opening, Sebastian comes across as a petulant brat. Be patient as you wrestle with the difficulty of the central relationship. Be patient, and trust that the author will deliver in the end. Sebastian, The Life of Sebastian and Hanna Greene, is available on Amazon here. Its sequel, Sebastian 2: Dark Times Arising, has been out for about a month and is available here.